Today we met up in our different groups to attend a lecture on the class/exam registration system utilized by Semmelweis: NEPTUN. The lecture was held by members of ISAS (International Student Association of Semmelweis). Each session was led by one main speaker and three or four student aids that ensured we completed the log in and registration processes correctly. I was happy to discover that the system is very easy to use and pretty straight forward. Any future registration process – whether it be for classes or exams – will occur through this education portal. Fall semester ends December 14th and after that, we have a 6-week exam period. As most of our exams are verbal, we can essentially make our own exam schedule. The lecturer informed us that on the day that the system opens for exam registration, there is a rush of students fighting for their desired exam spots. I prefer this to the alphabetical or accumulated credit points systems used at other schools. 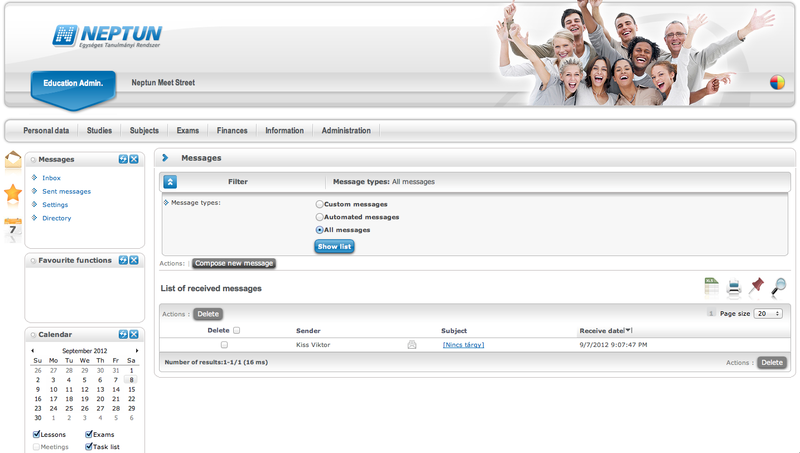 This way there is equal opportunity to sign up for your exams – granted the system doesn’t crash, of course. Don’t stress about taking electives in your first year. You are required to have completed 300 credits by the end of the 5th year – which averages to 30 credits per semester – but you will have plenty of time to catch up on credits in later years. Most of the freshmen electives are also available to 4th and 5th year students and since they have registration before freshmen, the electives are usually full. It is better to focus on the mandatory course-load. The book list that is sent out by the school is not a list of books required for your classes but rather a recommendation list of books that you can buy. There are no assigned books for any of your courses. If there are any required texts or materials, you will be notified by your professor or even given a print-out in class. When it comes to choosing your books, make sure that you take the time to look through the different versions and chose one that you really like. Some anatomy books have detailed drawings instead of actual pictures and this can make it difficult for you when faced with the real thing. Buy your books at the book fair at Freshman Day. Try to figure out what you need beforehand so that you know what to get when you are there. Avoid buying books at the university bookstore – they are much more expensive there. Some books are available online. If you are the kind of person that prefers an online textbook, this is a good option for you. Don’t overload yourself with a large array of books. The more books you have, the more cluttered and confusing your study sessions will be. It is better to know one book well than have a scattered understanding of several books. The anatomy professors at Semmelweis are geniuses and will go deeper into the subject than your book does. Take good notes in your lectures because everything mentioned is fair game for the exam! If you want a detailed anatomy text – one akin to the knowledge level of your professors – try Gray’s Anatomy (but beware: the book is very extensive and may be more detrimental than beneficial). The Thieme pocket books are perfect for your first semester of anatomy (in addition to your main text and atlas). Volume 1 covers almost everything you need to know in that first semester and is much easier to digest than the larger texts. As brilliant as most of the professors are, they are not paid very much to teach us. It is important that you show them respect and don’t let yourself get offended if there is even the slightest negative regard towards your being an international student. If you show interest in the subject and are open to doing more (such as being a teaching or research assistant), they will greatly appreciate your efforts. We headed home for an hour to relax before heading out to the dock where we would board the boats for the sightseeing trip. We met up with two other students: Rina, who is Japanese but grew up (mostly) in the US and has a degree in Neuroscience, and Frida, who is Turkish/Norwegian and has lived in Norway for the past 10 years. Drawing detailing the departure point and course of our sightseeing boat trip. The sun was setting as we left the dock, which made for some quite amazing scenery. 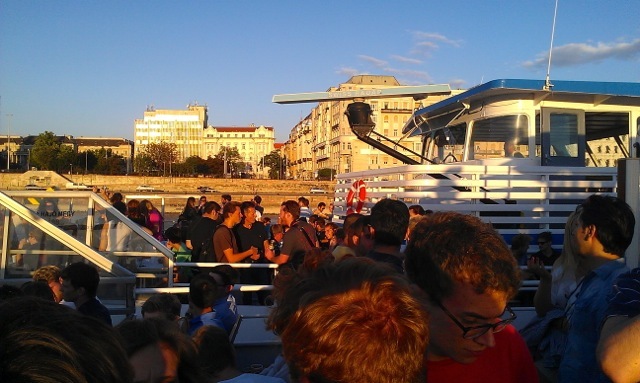 We made our way onto the first boat and then through to the second, which was tied to the first by a series of ropes and connected by a platform so that people could cross between the two. With our complementary bubbles in hand, we headed up to the top to secure a spot on the deck. The front area was already full but we were lucky enough to find an empty spot against a railing. The students invited included all attending the pre-med program at McDaniel College, the veterinary students from Szent István, and finally all six faculties of Semmelweis (if I am not mistaken), including the Hungarian, German, and English medical programs, and the dentistry and pharmacology programs. We, regretfully, decided against bringing our camera on the boat trip. Luckily, Frida brought hers and was good about taking photos. I stole this one from her facebook page. 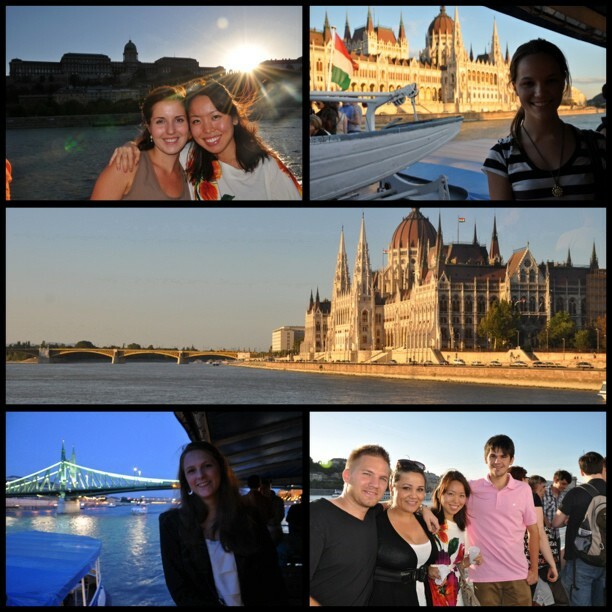 The bottom left picture shows Skjalg, me, Rina, and Arthur, a Hungarian/American medical student whom we met on the boat trip. 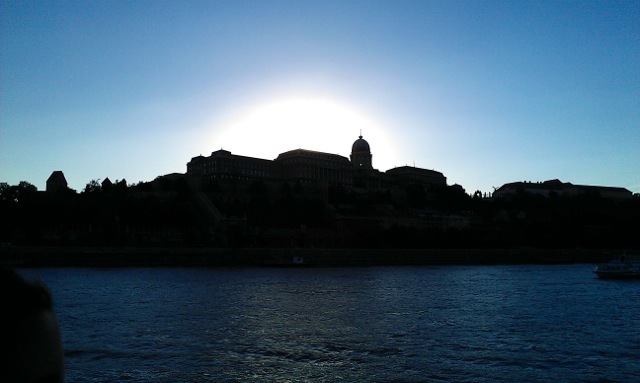 You are currently reading NEPTUN Lecture and Danube Boat Trip at Buda-B.